The Hidden Child Pupil Premium Plus Cathy Moss (HLTA) Education Support. 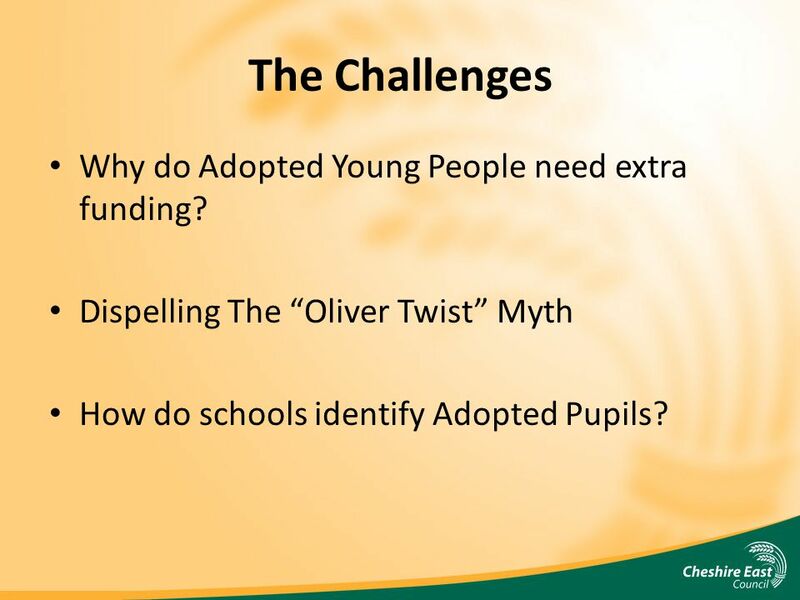 3 The Challenges Why do Adopted Young People need extra funding? Dispelling The “Oliver Twist” Myth How do schools identify Adopted Pupils? 7 Our Committment Supporting parents and schools to raise awareness and identify the challenges faced by adopted young people. 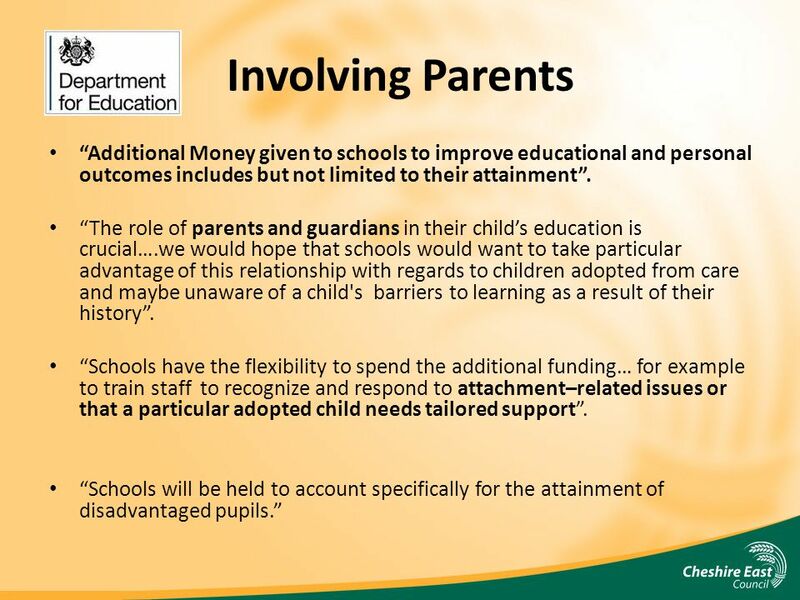 To ensure that specialist knowledge, is shared and to raise the profile of the “adopted pupil” through “attachment” focused training, strategies and interventions. 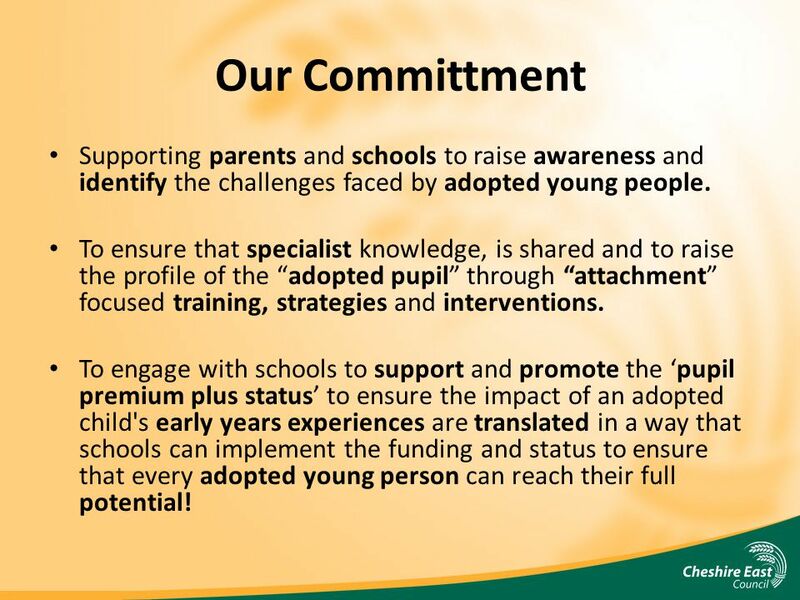 To engage with schools to support and promote the ‘pupil premium plus status’ to ensure the impact of an adopted child's early years experiences are translated in a way that schools can implement the funding and status to ensure that every adopted young person can reach their full potential! Download ppt "The Hidden Child Pupil Premium Plus Cathy Moss (HLTA) Education Support." Overview Securing School Improvement. Welcome and introduction AIM Understanding the Ofsted Inspection Framework To give some insight into how some of. Education initiatives: HR implications Cathy Brearley 30 January 2013. £ Fair Funding RAPs Quality Staff Supply and development Services (SSE) SEND & VL Early Help and Specialist Services Compact Oversee quality, Value for. SCHOOL DAZED? CREATING NEW PARTNERSHIPS WITH SCHOOLS Date 15 th December 2014 Presenter Sharon Long. 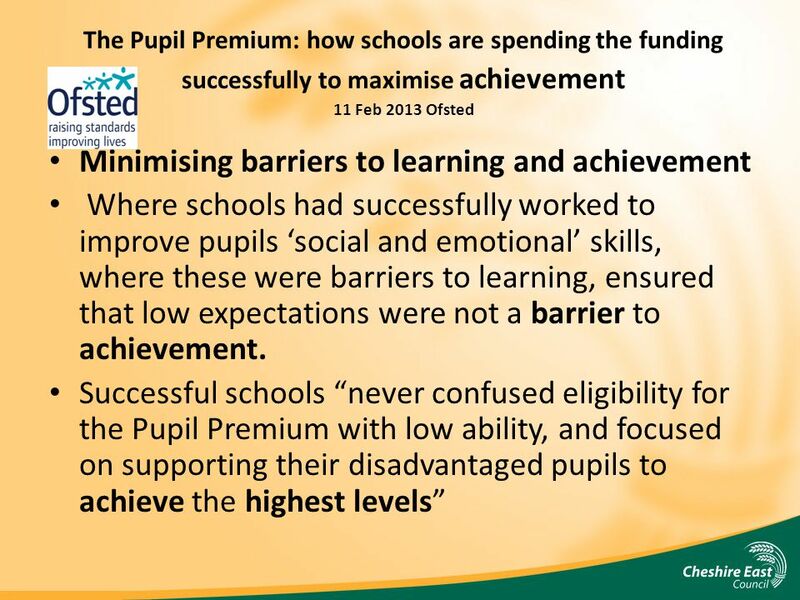 The big challenge for our generation of school leaders: using the pupil premium to narrow the gap Worcestershire Pupil Premium conference 21 January 2015. Free Early Years Education Places 2 Year-Olds Barbara Mands Head of Childcare Strategy & Business Management Service Debbie Adair Access & Inclusion Support. Extended Services – ‘Myth Buster’  ES distract a school from its core business of teaching and learning  There is no funding – who’s going to pay for. Narrowing the gaps using pupil premium funding Peter Cox. Effective Spending of the Pupil Premium and Demonstrating Success Thomas Sparks Assistant Principal. 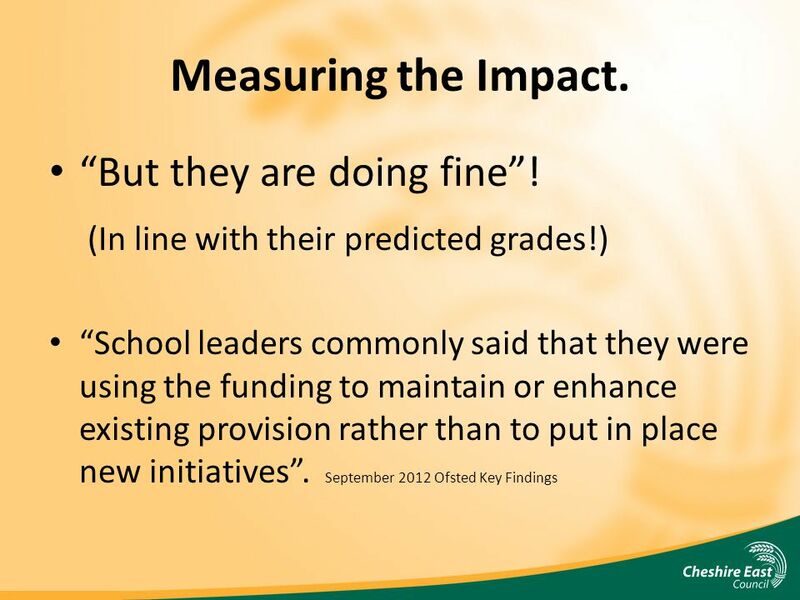 24 March 2015 The Pupil Premium Monitoring its use and impact Chris Wood, Her Majesty’s Inspector. Children and Family Services Provider Briefing Welcome Spring 2015. 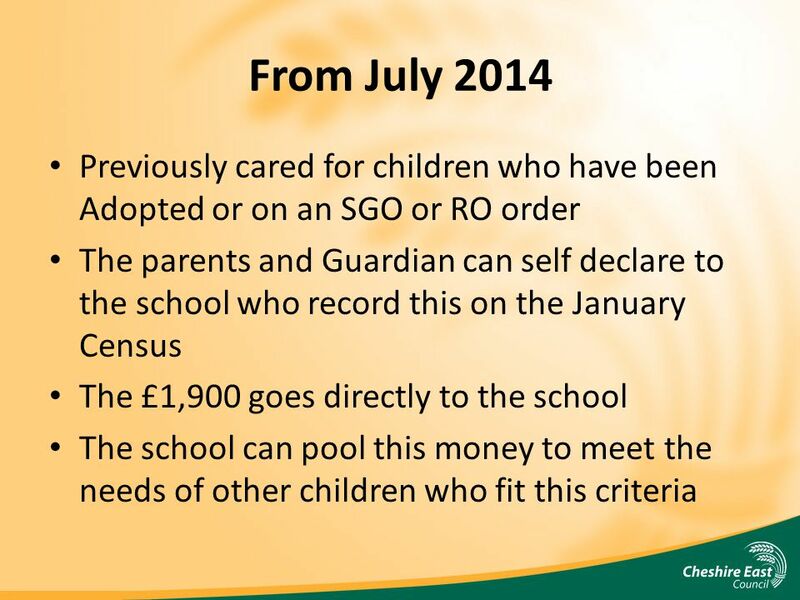 The Early Years Pupil Premium Information for providers.